It is always nice to get a new timber shed, garden workshop, playhouse, solar potting shed or summer building in your garden but you do need a solid base for them to sit on to ensure you get the best life out of the building. The normal options are concrete, paving slabs, timber decking, timber joists or ProBases Whichever one you use you need to make the best job you can do because your new building will rely on your base. If it’s not correct it may affect the life of your new garden building and, in the worst-case scenario, it might not be possible to build your new building causing inconvenience and extra expense. You may decide that you will get someone in to do this for you and if so, we can help. We can recommend Viking Services to supply, build and level pressure treated and fully tanalised base for you. If you decide on this type of base Viking will bring all the required materials along, they will construct the base and then ensure that the base is 100% solid and level to take your new building. They will make this base using pressure treated timbers and your building will sit on top of this base ensuring that your new building is well protected from any dampness coming up from the ground. 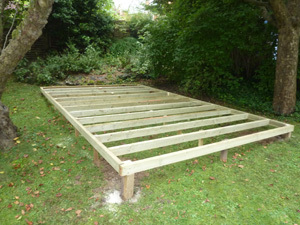 This will help to ensure that your floor and garden building will last a very LONG time. All you need is a reasonably level piece of ground. 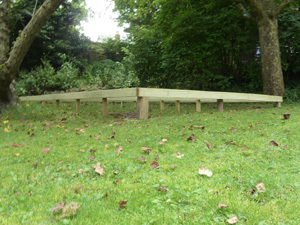 However, it is possible to build even on uneven ground but you would need a special quote for this. The option of this base construction service is the real big news and it is something that should be considered by everyone. It is vital to the longevity of your new shed, summerhouse or home office that it sits on a good solid foundation. Without this the life of the building will be severely reduced and you may find the building listing to one side, the floor bouncy and rotting, doors and windows sticking and the roof leaking. If you are interested in this service then you need to contact Viking Services direct on (07792) 060216 to arrange a suitable date for you. Although Viking Services is a separate company to 1st Choice and your dealing and questions should be directed to them we have used their services for over 18 years. In fact, the majority of our show buildings are built on top of these subframe bases and these take far more use than a normal garden building in the normal garden.